When life is out of control doesn't it make sense to push the envelope just a little bit more? My husband's ongoing health saga has just reached the one year mark with no resolution and the sense of helplessness continues. So, as a means of feeling in control of something (anything), I've been gearing up to join Andi's group on Ravelry when they kick off a new knitalong tomorrow. 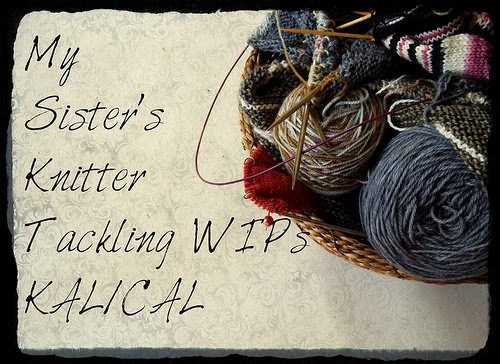 It runs September 1st through December 31st and the goal is to concentrate on those pesky wip's ('works in progress' for you nonknitters). Anyway, I put much thought into what my goals were for the remainder of 2014 and cast on everything that I have hopes of completing. 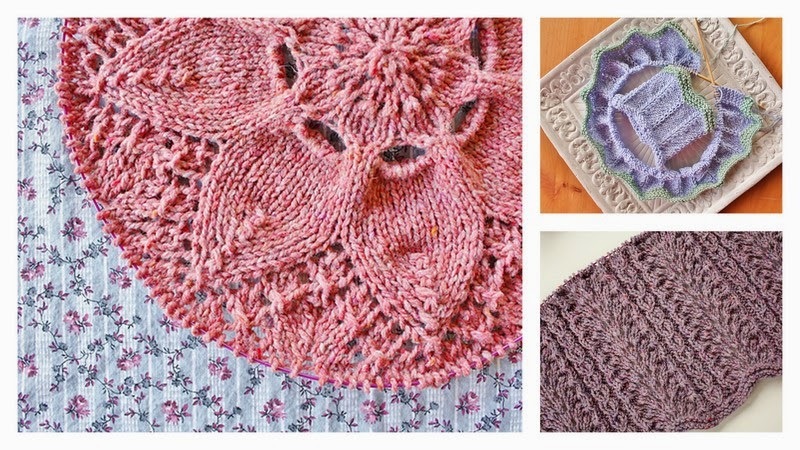 Today is the final day to cast on and have your project be included in the knitalong (yes, there are prizes!). Surprisingly, this gigantic task doesn't have the Virgo in me the least bit stressed. I have plans to tackle all these things and feel like I've accomplished something momentous. I need that right now. Do you have piles of started projects that are nagging at the back of your brain? If you do, you should pop over to Andi's group and join us. It's a fun bunch and they'll cheer you along during the next couple months as you start emptying your baskets and bags of unfinished knits. 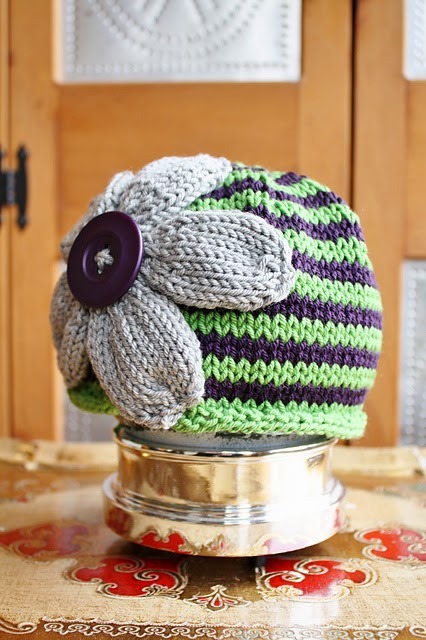 Last year during the holidays my husband, who never asks for anything, came home from work and asked if I would mind making a hat for his coworker's daughter. His coworker, Dre, was thrilled and bought his daughter new outfits to go with each hat. To hear how much they were appreciated by Dre and loved by his daughter was more than enough thanks for me. What knitter's heart doesn't melt when something they make is truly loved? How incredible is that? Want to hear something even more fantastic? Dre has spent the last year making this basket for me...himself...by hand. Dre's heritage is Cheyenne and Nez Perce Native American. He learned basket making from his grandmother so that he could pass it along to his children. I feel so lucky to have such a treasure given to me. Dre told Jason to tell me that it isn't perfect and I told Jas to tell Dre that yes, indeed it is. I was speechless when I saw it and have spent much time looking it over in awe. I think it's wonderful that his daughter will be able to learn this craft from him when she is older, and that he wanted to be able to pass some of her history along to her. That's it for now ~ I've got a bunch of stuff I want to post but I really wanted to take the time to share this right now. I'll be back soon, promise. Well, I'm so happy to report this beautiful piece is finished and waiting for it's bath. 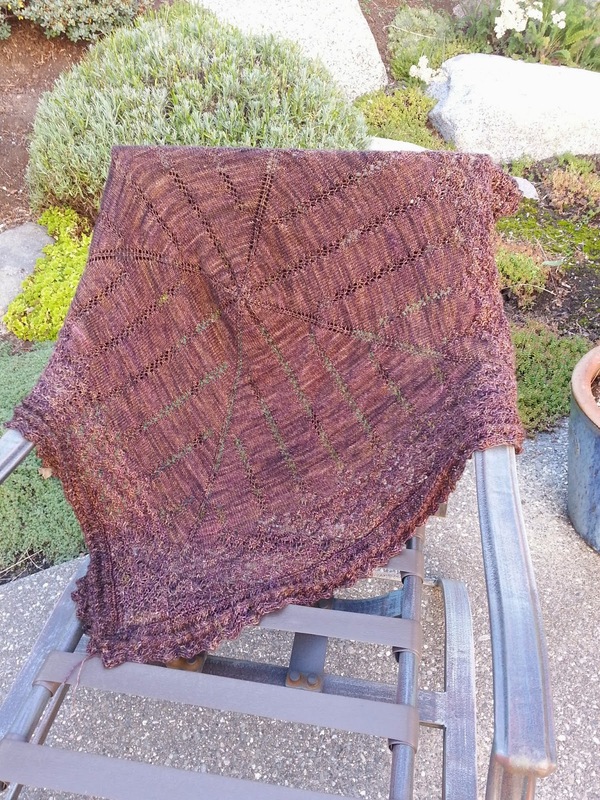 I have learned so much, struggled a little, worked on perseverance (and succeeded) and thoroughly enjoyed the time spent with this pattern and yarn. 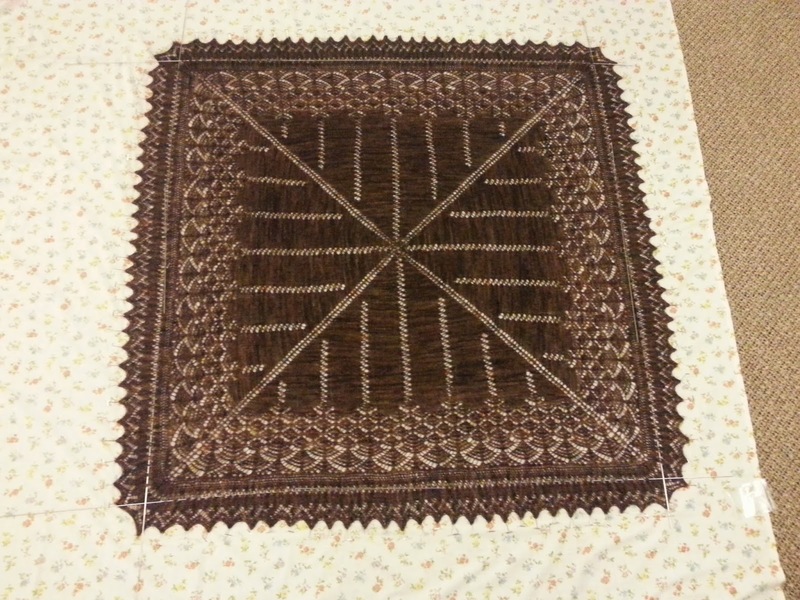 I can't wait to post more photos after blocking. memories in here. Always trying to keep camera in tow. This great handmade box kinda holds my past knitting adventures and mishaps like my heart does. Except with pictures and written notes, I usually remember better. Melissa 'silent auctioned' this box (for charity), a few years back, at our knitting retreat. I made sure nobody out bid me. A favorite place to go when I need a smile. What a treat! Loved knitting this up. A great design. to stop knitting on it. I'm at the official 'halfway' point for the Streusel knitalong ( ravelry notes here ) ~ 40 stitches prior to my marker. I've used just under a third of my yarn (27.5g / 144yds). She measures 22.5" long and 8.5" wide without stretching my work at all. ...I'd be crazy to stop now! How is everyone else doing? Hoping to see some progress photos and hear how you all are enjoying the pattern! 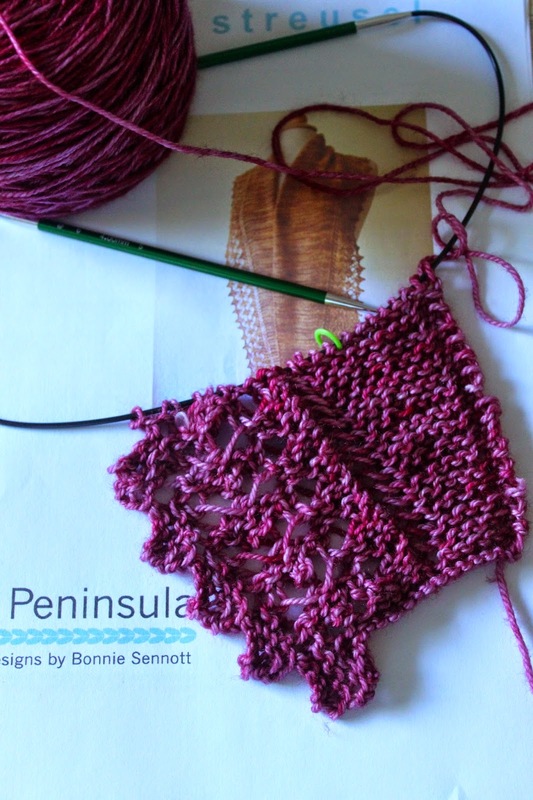 I'm also on the downslope of my test knit ~ I can't wait til dandiliongrl releases her High Plains pattern! I think it's going to be a huge hit! 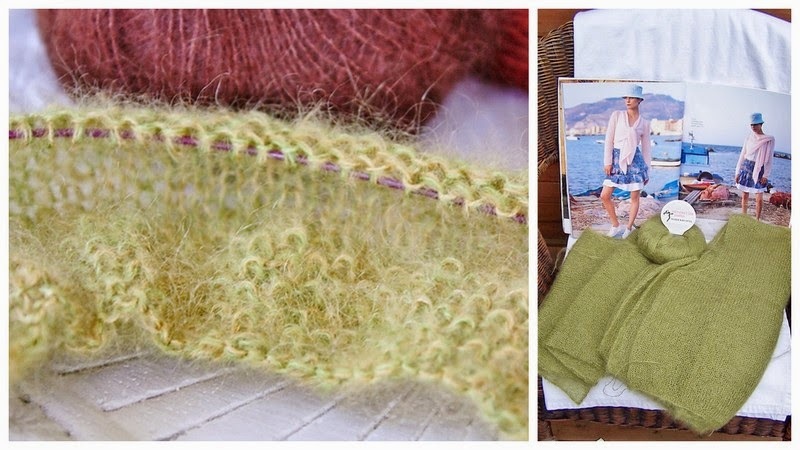 I learned a new seam (she provides a link to a 'how to' diagram and instructions) ~ I can't remember ever joining a live horizontal edge to a vertical edge. All that's left is a border and it's finished ~ I already highly recommend this pattern and I can't wait to make it again. I had to stick to the pattern this time since it's a test knit but I have an idea rolling around in my head how I want to change it up just a little the second time around! I'll make sure to share a link to the pattern when it's available to everyone else ~ until then, my ravelry notes can be found ( here if you're interested﻿ ). 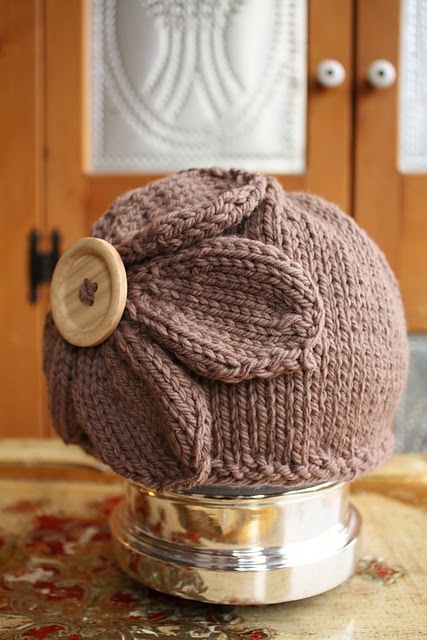 here's the link to the pattern page if you want to peek . Gotta get ~ there's football to be watched and knitting to be done! Update Aug. 29th: Carolyn is loving this project and thinks she might knit another one of these days, but in the mean time, I took a photo last night. 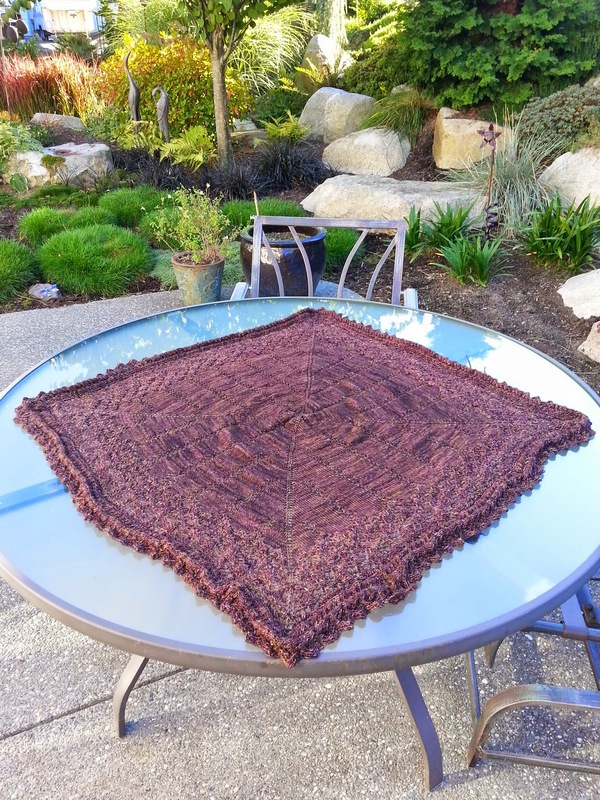 Happy to report, Carolyn is going to join us in the Streusel KAL, since she bought the pattern and downloaded it. 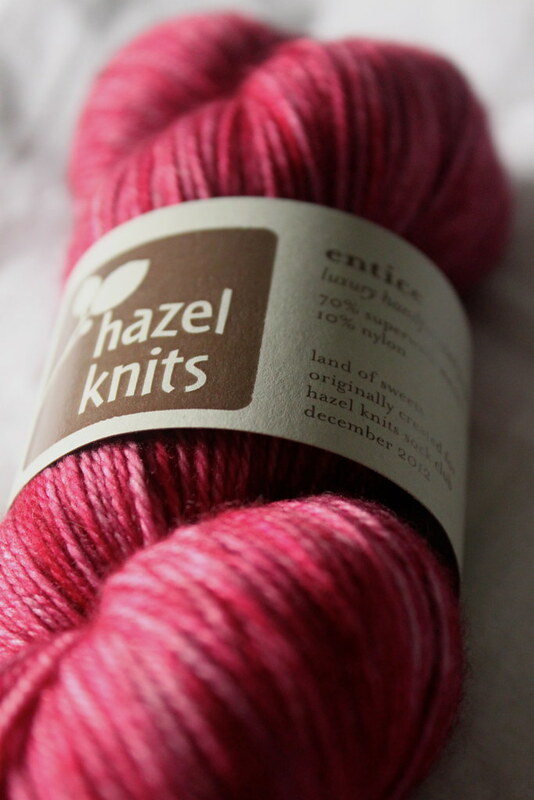 This is the yarn she's using. (Oops, I meant to add... this is Entice, and the color is Carnelian). Because I know she won't do it, as soon as C has something to show off, I'll take a picture and post it. Has anyone seen the movie Pitch Perfect? It's about this college A Capella singing group, with a leader who is painfully perfectionistic and rigid. Enter the main character ~ a non-conformist, who specializes in creating musical mash-ups by mixing different songs together. She joins the group, and shakes everything up, encouraging the other singers to let go of their outdated song sets, and embrace her ideas. Ultimately, she inspires them to incorporate new ways of blending songs and lyrics, to create a masterpiece performance that wins them first place in the A Capella competition. Well, this very thing happened to me recently. Instead of A Capella, it was a fiber related transformation. I had been spending more and more time at a nearby knitting shop called StevenBe, run by the amazing Steven Berg, when I learned of the upcoming tour that he had arranged with Stephen West. Officially, it is called the Stephen&Steven tour, offering classes all over the country, running from mid June to mid August. 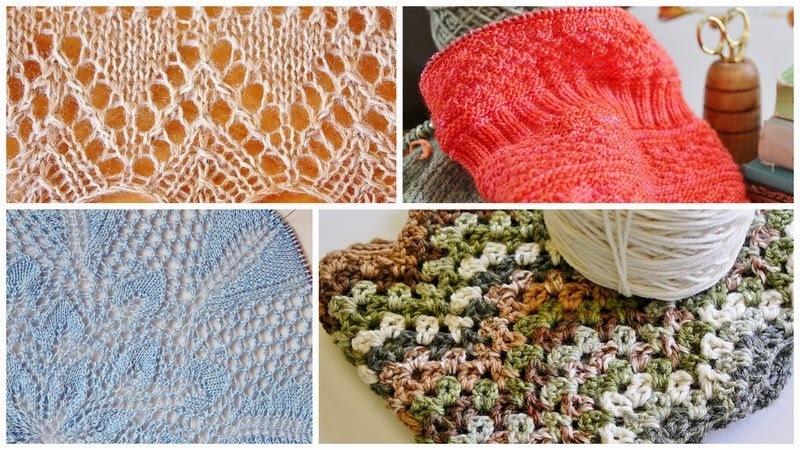 I attended the kick-off cocktail party for the tour, an inspirational trunk show, and a class called the "Dynamic Duo", which was a free-form class to help you take your knitting and break away from patterns to create your own designs. I have been gushing about them ever since! My husband teases me about it mercilessly, and anyone who I talk to on a regular basis has heard about them. 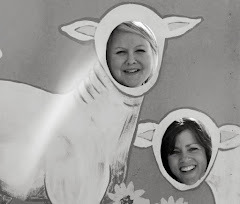 I was so inspired by these two incredibly talented knitters. Steven Be is all about being a "Yes-Knitter" and letting go of worrying about mistakes ~ He says "Try not to make them again, but use them as opportunities." Stephen West is more of a visionary and he has a gentle approach, which I was very drawn to. I've been knitting his patterns ever since the class, but I find that instead of knitting the patterns as they're written, I've been doing my own mash-ups. I combined his Welty shawl with the Starshower Cowl, which I'm really liking. I started Lumpy Space, but found that the first panel I knit wasn't quite the color combination that appealed to me, so I think it will become the basis for a free-form garment. This is such a deviation from the knitting of my past, which was very calculated, adhered to the pattern perfectly, and was free of mistakes. I'm growing as a knitter! This brings us to the most recent knitting mash-up ~ After knitting eight repeats of Streusel, I decided to rip it out and restart it as a poncho. I'm incorporating elements of the Etched Rio Wrap into the Streusel pattern. I am really looking forward to seeing how it turns out! 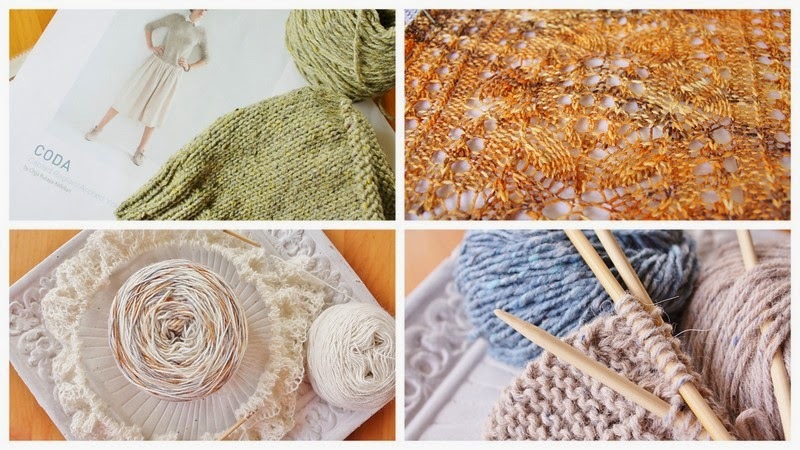 I cast on seventy stitches, fourteen of which will consist of the lace pattern. I don't have much done yet, (who knew that a puppy would take up so much time? ), but I will do another update when there's more to see. Lov'in this Knit A Long, and everyone's colors are so beautiful. I meant to post yesterday, on the actual day, but the title of this post says it all. 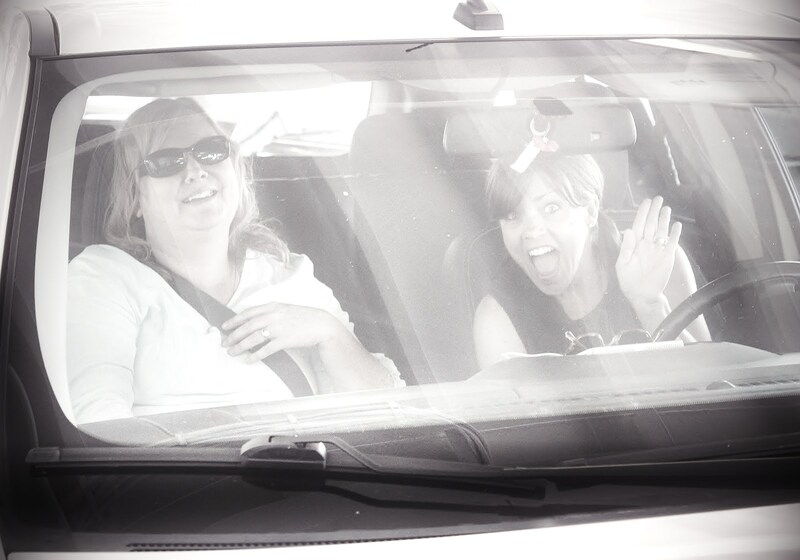 I'm also a little late to the party on following Melissa and Kelli's blog, as I have only discovered it within the last year. That doesn't stop me from wishing you both a very happy 5th blog anniversary. 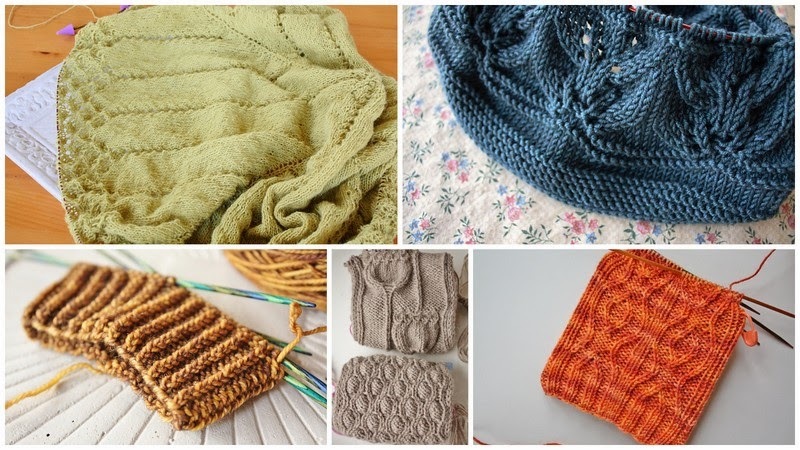 Thanks for the wonderful photographs, lively content and so much knitting inspiration! I may have been late to the blog anniversary party, but I wasn't late starting the knitalong, despite spending a couple days dithering over yarn. Should I knit with this? 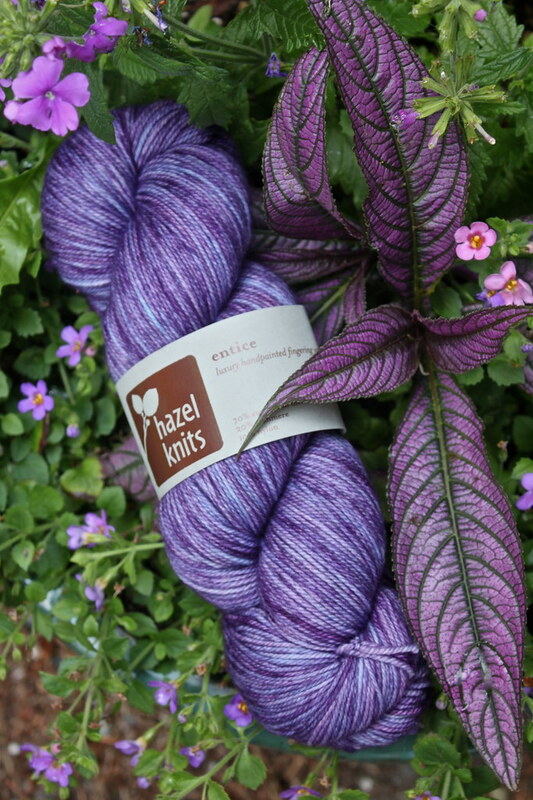 In the end, I was in more of a pink mood (but really happy to have an excuse to post one of my favorite purple yarn photos) so Hazel Knits Entice in the Land of Sweets colorway was the choice. I moved on to winding my yarn and then cast on. 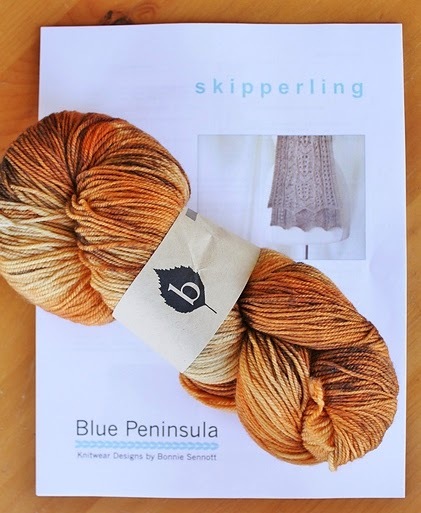 I'm really happy to be part of this KAL, and I'm looking forward to seeing and reading about everyone's progress on Bonnie Sennott's beautiful pattern. And Melissa, thanks for organizing this! I am fairly certain Carolyn will be joining us. Her daughter and family are in town, it's not likely she'll choose knitting over the grandkids. C has yarn, and when I find out what it is, I'll post it for her. 100% guaranteed she won't do it, the stinker. I'm also working on a test knit for dandiliongirl on Ravelry (notes here) ~ another poncho to add to my collection...this one with a lace panel...again, giddy :) ... lace ... mmmmm, lace!!!! So not much chatter from me today ~ the sun is shining (it's hot!!) ~ I'm going to sit in the shade and listen to some tunes and knit the day away. I'm imagining you all gathered round, needles clickity clacking away, joining me in all the fun! 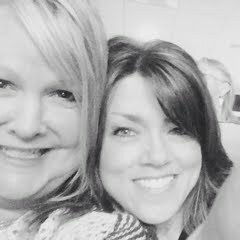 Thanks for celebrating with Kelli and I ~ I love that you all come back and knit with us when you're invited! Looking forward to hearing from more of you and seeing some progress! And newcomers are still welcome ~ it's never to late to join in the fun :) ~ Happy Friday !